Last month we showed you some models from Zara’s 2013 Spring and Summer collection that could be also double as maternity wear, now we’ll give the lowdown on the Spanish retailer’s specific line for maternity clothes that they naturally call ‘Mum‘. Zara’s newest Mum’s collection for 2013 has a number of inexpensive and casual solutions, like jeans, t-shirts and a pair of cute summer frocks that can help our maternity wardrobe grow along with our expanding waist line and abdomen. Let’s start with the pants. 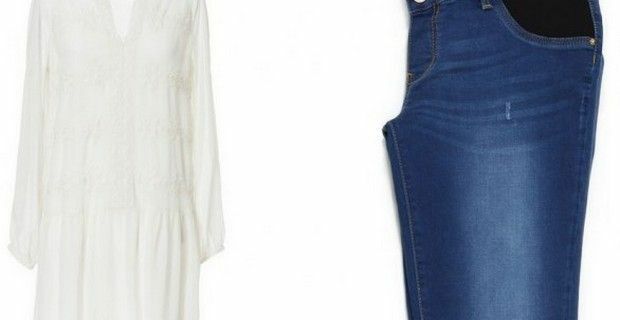 Finding pants that fit properly is probably the hardest item to find when you’re pregnant, but Zara has several models in denim with comfortable elasticated waist side bands . Jeans are the non plus ultra of casual chic wear and if you don’t want to give them up while you’re pregnant Zara’s offers these 98% cotton pants - the other 2% is elastane - in classic denim blue, black and light blue and even if they have an elastic waist they are cigarette styled with the de rigueur tight ankle, and if you’re young expecting mum, there is also faded denim jumper with a rips in the knee area. Next up are the t-shirts. The Mum’s line offers very inexpensive t-shirts with raglan sleeves that comes in off white, apple green, blue, bright orange and naturally black. For just a few pounds more you can purchase their low cut batwing tee that comes in six different colors, from white to indigo blue, but also in orange, turquoise, pink and shrimp. They also have cape style t-shirt in bright orange, neon yellow and bright turquoise. Zara’s maternity collection also features two short and pretty frocks: one is tunic styled with embroidery, while the second model is a more of a flowing style with dark colored embellished shoulder straps and both dresses are available only in the color ecru.